As most of you know, I started this blog as a way to keep in touch with friends and family when an unexpected move took us from sunny South Carolina to the land of the midnight sun, Alaska, for the 2010-2011 hockey season. We were over 4500 miles from home base in Toronto and this blog (titled "Our Alaskan Staycation" at the time), was the perfect way to share our Alaskan adventures. Little did we know, we would end up staying for three years and this little blog of mine would expand beyond family and friends and be read by people across the world. "Well the rumors are true… Steve got traded from a team in the the sunny south to a team in the great white north, over 6700 km away. In exactly 3 days we will be on a plane to Anchorage, Alaska! I got the call from Steve on Tuesday, October 12 while I was in Walmart buying stuff for my road trip down to Greenville, SC. It’s a phone call I’ve gotten before but this time wasn’t one I wanted to believe. I’m pretty sure my response was “Don’t lie to me!” as I stomped my foot like a two year old having a temper tantrum. I had just put my bathing suit in my suitcase that morning!! I immediately drove home to start my research. After a few days of thinking it over, and some cold feet/partial panic attacks, the decision to move became official. Not many people can say they have had the opportunity to live in Alaska! Not only do the pictures look amazing but everyone we’ve talked to has had nothing bad to say about the place. It will be a huge change, including a HUGE temperature adjustment, but definitely one for the best. Steve can now focus on having a great hockey season and I can keep my fingers crossed on banking a seriously sick job, hopefully in biology, when we get up there. So until next time… when we are exactly 71 hours from Toronto (according to Google Maps) and much much colder in the land of the midnight sun…"
Do you have any memorable "firsts" to share? This is a great first post and perfectly sets the tone for your adventure to come. I think I might've thrown a mini tantrum myself if I found out I'd be moving to Alaska in the middle of a Walmart too hehe. But look at how well everything turned out! My husband lived in Alaska as a child and loved it there as well. Thank you! And open mind was definitely key, and I don't regret the decision for a minute. Well it's kind if deceiving, the closest part way the hell up north is that close, but I assure you Sarah Palin cannot see Russia from her house. 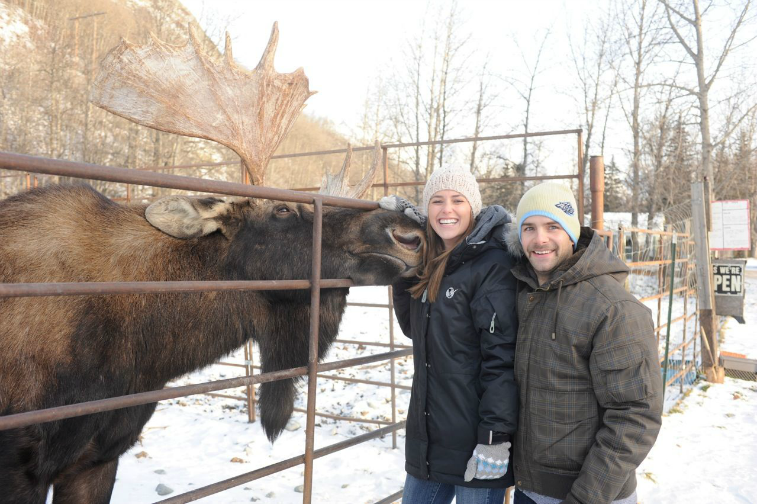 I got to do one better than pet, I got moose kisses! I think this was an awesome first post! awwww I love the moose. so cute. :D and not sure i could go to alaska although i love to sleep in the cold. not sure i could stand it all the time. It's only cold during winter. Summers are beautiful! Your first post was great!! Mine was something lame like "Oh, hi! I'm blogging now." Lame. I'm not sure I can imagine the culture shock from going to Alaska from South Carolina. Wow! Thank you! I didn't actually make it down to South Carolina, the plan was to be driving there a few days after I got this call. My husband was there for about 2 weeks though, and was very much enjoying the warm weather I was looking forward to. really impressive first blog post! and i too did not know russia and alaska were so close! Thank you! It's close, but I assure you Sarah Palin cannot see it from her house. That's a great first post! What a fun adventure, but that would be super scary! That is a huge move. I have visited Alaska, but I can't imagine moving there. Great first post!